As clearly suggested by its title, Spring, Summer, Fall, Winter… and Spring has a structure split in five acts. 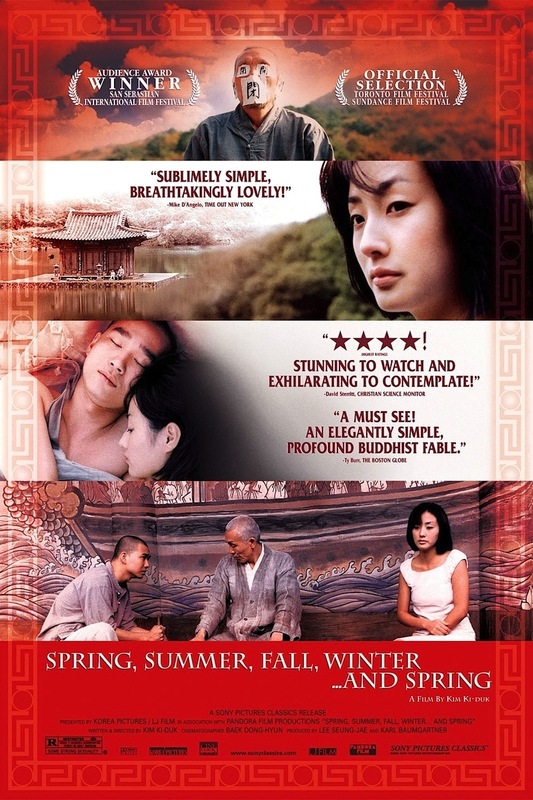 The four seasons – with the repeating Spring book-ending both the plot development and the main character’s life arc – are visually prominent, as the story takes place on a monastery (a Buddhist temple) floating on a small lake. Nature is an essential character here, and Kim saturates each scene with simply observed images of the lake’s surroundings – a frozen lake, a rain-battered lake, a small river, rocky hills, mountain tops and lush greenery. The carefully planned shots are never just self-serving beauty frames – nature provides not just the setting, but the backbone of the story. Kim is obviously a nature’s man (evidenced through his impressive acting turn in the last two segments) – and the film benefits greatly from his decision to set this fable of a film away from the big city and civilization as a whole. The main character is a boy who grows up to become a young man, to experience love, passion, and doubt; to leave the monastery, despite the cautioning of his old master that “desire leads to attachment, and attachment leads to the intention of killing”; to then return, after committing a crime, in search of the necessary inner peace that precedes redemption; and to later take the place of his old master, but only after becoming synchronized with the world that surrounds him – and ultimately, after being able to understand this world. That’s the skeleton of the film’s plot, and – infused with Kim’s spiritual attitude to film making – it is closely connected with Spring, Summer, Fall, Winter… and Spring‘s theme. This theme has Buddhist undertones I am not qualified to discuss, but which are openly suggested by Kim through his visual choices and fable-like scenes (for instance, the prominent and somewhat mysterious presence of animals such as snakes, a rooster, a cat, fish and frogs). I guess the theme has to do with the necessity to live through and overcome carnal temptations, to first be weak and make mistakes and sin, before you can achieve balance and discover your own place in the world. The main character’s goal is not readily visible or simply defined. The most obvious answer is that he is trying to be with the girl he loves, but this is only clearly valid through the second (Summer), and then resonating in the third (Autumn) segment. Later, on his first return to the monastery, his goal becomes to try to escape from punishment for his crime; and then – on his second return – to atone for mistakes made earlier in life. The changing goal works in the set-up of this particular film – I guess simply because the film encompasses a full life cycle, and also because the story is so openly set as a fable. The main character’s conflict is predominantly an inner one – a struggle between his devotion to his teacher and the way of life the teacher is trying to inspire in him, and the temptations of the “secular” world and his own human nature: a child’s cruelty, sexual lust, jealousy and rage, the urge to avoid taking responsibility for his own mistakes (selfishness). There are external manifestations of this conflict – the confrontation with the teacher when the latter decides to send away from the monastery the girl he loves, or his attempt to hide from the police officers pursuing him after his crime. But the conflict is ultimately an inner one, and in the end the hero is left to tackle, on his own, his own weakness, and to pay his debt to nature and nature’s divine order. As the conflict is resolved, the hero is literally positioned on the top of the world (in Kim’s visual language – a mountaintop overlooking the small lake with the floating monastery), naked and alone, clean and ready to care for another person. That person is a young boy brought to the monastery and left there by his faceless mother. The circle of life closes on itself, and is complete – only to start again from the beginning.